This 24″ by 60″ sign is primarily in the shape of a rectangle, but it is die cut with some design elements on all sides. The sign is red, yellow, and black. 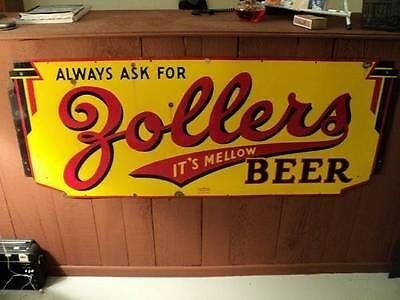 The text reads “Always Ask for Zollers Beer It’s Mellow.” The “Zollers” is written in a script as opposed to the sans serif and serif type used on the rest of the sign.